This rare copy of the suffragette newspaper, 13 June 1913, is a recent gift to the Stirling Smith collections by librarian and Bridge of Allan historian, Malcolm Allan. It describes the tragic circumstances of the death of Emily Wilding Davison, who died under the hooves of the King’s horse at the Epsom Races, a hundred years ago. New research on surviving film of the event shows that Emily was trying to pin a purple, green and white suffrage scarf on the King’s horse. These scarves were screen printed by students in the Glasgow School of Art, and Emily’s scarf is now in the House of Commons. 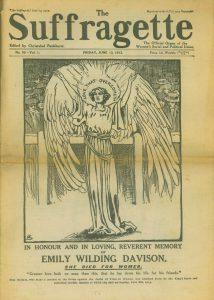 The newspaper reveals that Emily Davison was jailed eight times before her death, and force fed 49 times. It was the Scottish suffragette Marion Wallace Dunlop who invented the tactic of the hunger strike, as she wanted to fight for political freedom like her ancestor William Wallace. The government response was to force-feed the women. Suffragettes responded by attacking property, to get the attention of the insurance companies when the government would not listen. In Stirlingshire, the Wallace Sword case was broken in the National Wallace monument, Ballikinrain Castle was destroyed by fire, Airthrey Spa Bowling Green was damaged and Prime Minister Asquith was attacked with a dog whip at Bannockburn.